Wisconsin Gov. Scott Walker has opened up a big lead on the field of 2016 Republican presidential contenders in New Hampshire, according to a new poll. Public Policy Polling's latest survey of the Republican primary in New Hampshire has Walker at 24 percent, 10 percentage points ahead of Ted Cruz at 14 percent. Rand Paul comes in at 12 percent, Jeb Bush at 10 percent, Marco Rubio and Chris Christie at 8 percent, Mike Huckabee and Ben Carson at 7 percent and Rick Perry at 4 percent. 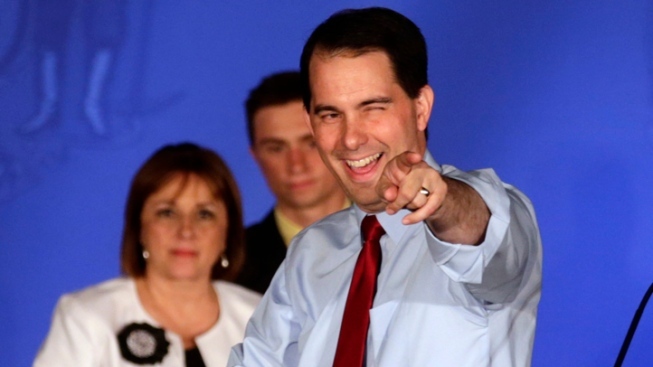 Walker is also the best liked potential GOP contender in New Hampshire, the poll found. Fifty-seven percent of voters have a favorable opinion of him. He is also strong with conservative voters. When Public Policy Polling last polled New Hampshire a little over a year ago, Christie led the GOP field at 24 percent. Walker and many other big-name Republican presidential hopefuls are due in the Granite State this weekend for the First in the Nation Republican Leadership Summit in Nashua. On the Democratic side, Hillary Clinton polled weaker than in the past, but continues to hold a commanding lead at 45 percent. She was followed by Elizabeth Warren at 23 percent, Bernie Sanders at 12 percent, Joe Biden at 7 percent, Martin O'Malley at 3 percent and Lincoln Chafee and Jim Webb at 1 percent.